A radio galaxy is a galaxy that emits large amounts of radio waves. 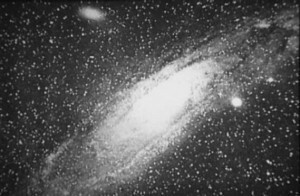 They were first discovered in the 1950s, but it wasn’t until the 1960s when a technique known as aperture synthesis was developed that we could resolve the distribution of radio emissions within a radio galaxy. It then became clear that many radio galaxies had a double-lobed structure emanating from a galactic core. It was suggested that these Double Radio Sources Associated with Galactic Nuclei be known a DRAGNs, though the term has never really caught on. We now know that these lobed radio sources are powered by a galaxy’s supermassive black hole. When a supermassive black hole eats nearby gas, dust and stars, it is known as an active galactic nucleus (AGN). These active black holes cause some of the surrounding material to stream off at high speed as jets. 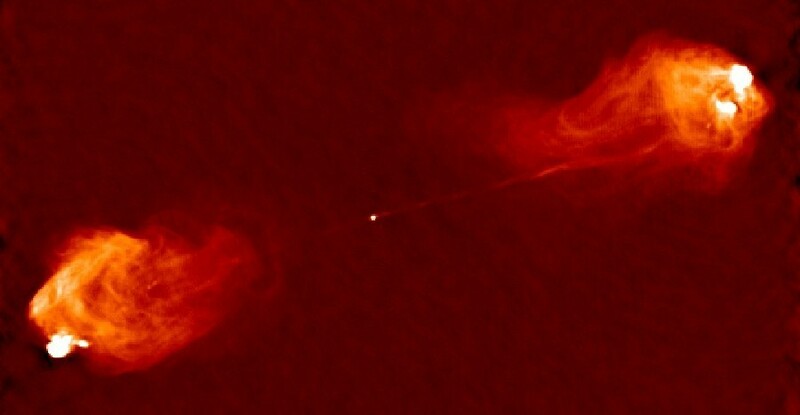 The jets stream away from the galactic nucleus at tremendous speed, and can collide with the intergalactic medium. This forms lobes of radio bright material, as can be seen in the image above. We see this in our own galaxy, which is one of the ways we know the Milky Way contains a supermassive black hole (although we also have more direct evidence). With our own galaxy we can see these lobes from past activity, but at present the region around the Milky Way black hole is fairly quiet. So it seems that supermassive black holes go through active and quiet periods. It is a pattern we see in other galaxies as well. When they were first discovered, radio galaxies and DRAGNs were seen as a distinct phenomena, different from other objects such as quasars an blazars. We now know that they are all driven by a similar process, and that how they appear to us depends largely on our view of the galaxy. We still use various terminology for radio galaxies, quasars, and the like, but we now understand that the lines between different categories are fuzzy. “With our own galaxy we can see these lobes from past activity”. Does that mean from observations in the past, or is there some other way to find out the past activity of a radio galaxy? If a galaxy has radio lobes, they were produced by jets. We only see jets in active black holes. We also know from observing a range of black holes that they can enter active and passive periods. What causes transition from active to passive period and vice versa?